Impatient beings that we are, we sometimes are relentless and eager when it comes to things that need time to develop. Orchid flowers are beautiful to say the least. Because of this more and more growers are looking for ways to speed up the process of growing and making them bloom. Once they do the bloom, we also look for ways to make their flowers last longer than the usual. Although there are specific things that you can do to speed up the process, it is still important to know how and when these plants naturally bloom. This will ensure better quality of flowers and, in time, give you full understanding on how orchids work. Some orchid flowers bloom for one week to up to four months depending on the species. Moth orchids are known for their long-lasting blooms. Different types of orchids bloom at different times in the year – some once, some twice, some continuously. Usually orchids bloom when the weather starts to become cooler. Winter and spring are the common blooming seasons for orchids, but orchids can actually bloom anytime of the year. You can imitate cold weather and have them bloom by placing them in large coolers. A 10 degree drop of temperature can trigger their blooming cycle. 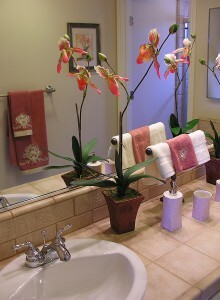 A good place for orchids to bloom in the house is the bathroom. Humid, cool places such as these imitate their tropical home. Give them enough space. An orchid with crowded roots will not bloom as well as well-ventilated roots. Repot them if necessary. Caring for orchids play a big factor on how orchids bloom. Be sure to give them enough sunlight and water to get them to bloom properly. There are certain things you can do to make the flowers last once they start to bloom like supplementing their soil with fertilizer once in a while. Once they shed their flowers, do not worry. They will regain their beauty and once more bloom when the time is right. Do you have any thoughts about the orchid blooming cycle? Please leave a comment below. If you think your roots are too crowded, here’s how to Repot Your Orchids. That’s wonderful to hear! Congratulations on your new obsession – welcome to the club! 😉 Thank you so much. I cut the flowering branch off! Now what, will it sprout another & how long will it take? They are absolutely gorgeous when they bloom! I had one in flower for almost 6 mos! i have an orchid that is blooming now for the third time this year. However after the first two times i did not trim the stems and now i have a new re-grow with leaves and blooming flowers on top of the old stem. What can i do with that? Can i cut it and repot it? if so, where should i cut it? Thanks for your comment. Do any of these descriptions sound like what you have? http://www.orchidcarezone.com/orchid-propagation-the-1-method-for-successful-orchid-propagation/ If so, follow those directions. hi, I exposed my orchid to cooler temperatures in my home overnight for the past 3 weeks to encourage growth and luckly enough one flower bloomed. My questions is should I keep expose the plant to lower temp until all the buds on the stem bloom or can I stop now? what is the best fertilizer for orchids ? To grow healthy and for them to have their flowers bloom so fast ? When an orchid start shootin growths from the stem are these roots or flowers and what do I do? Just leave them? It’s taken 8 months for this to start. I go to the clearance rack at Lowes and buy the orchids and african violets that have lost there flowers. I trim the spikes after the third section and have gotten many orchids to rebloom. I currently have 6 blooming and 10 more in spike from new growth. I use grow lights on timers in the basement. They seem to like this. BTW i usually pay 2 or 3 dollars a piece and purchased 10 very small orchids for 1 dollar each.